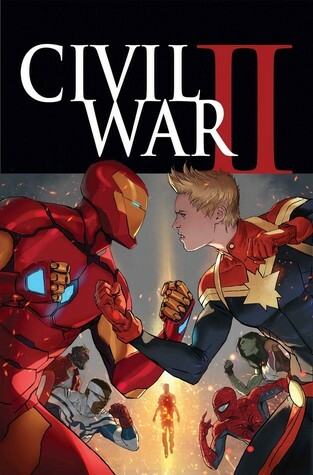 It’s been a bumpy road for Civil War II. Despite its epic scope and game-changing plot points, it’s largely been a big bag of “meh.” And that’s not even getting into the scheduling delays. Now, five issues in, it looks like things have finally picked up. The end of this book left a knot in my stomach. 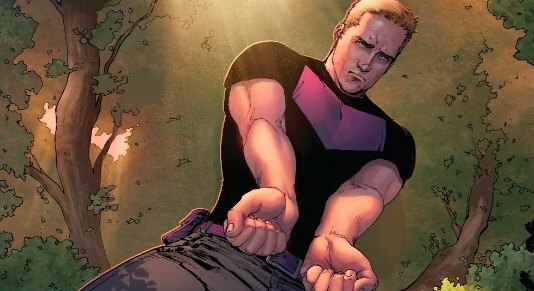 Despite having already killed off Rhodey and Bruce Banner, this series now finally has that heart-wrenching element that so many event comics strive for. Thanks Miles Morales, and uh…sorry? Ulysses, a new inhuman who can apparently see visions of the future, has torn the Marvel heroes apart. In Civil War II #5, they finally come to blows. 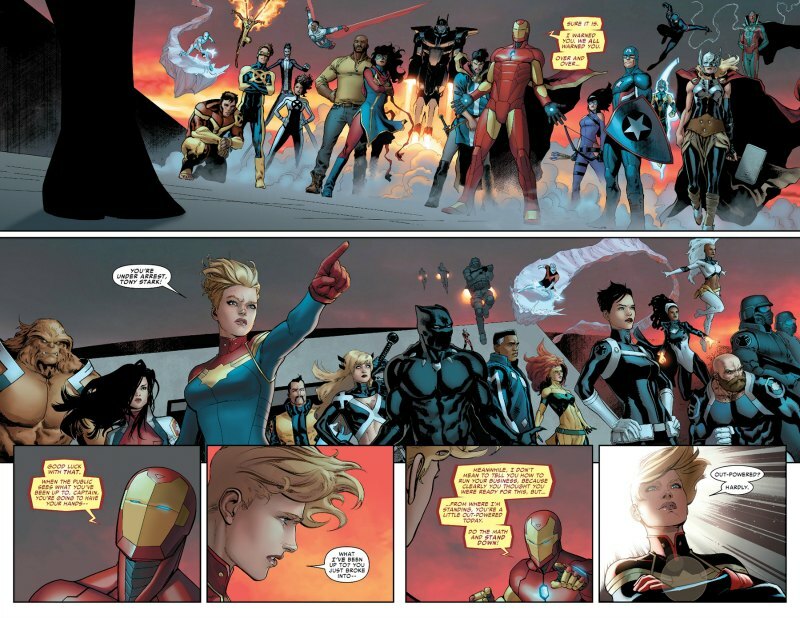 Captain Marvel, who believes in using Ulysses to stop certain events before they happen, has assembled a group to fight against a team led by Iron Man. Tony Stark vehemently opposes acting on these visions, and questions their credibility. But by the end of the battle Ulysses has yet another vision, in which one of the Marvel Universe’s youngest heroes does the unthinkable. 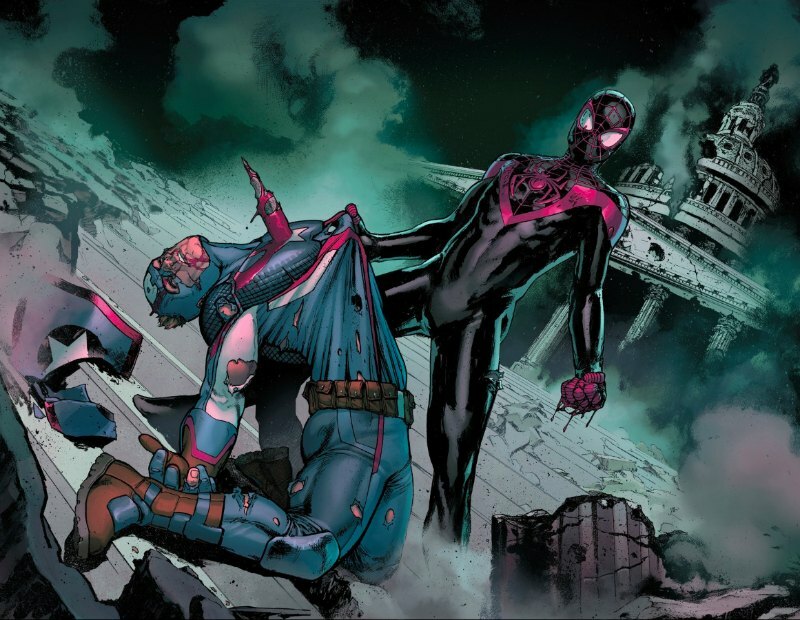 In a story that’s already seen the Bruce Banner murdered by Hawkeye, and Rhodey die in battle, the burning question is: Will Miles Morales be next? The image at left is our big vision reveal. Miles clutching a dead Captain America in front of a decimated Capitol Building. It may as well be an page from Red Skull’s dream journal. Now all the prior emphasis on Miles makes sense. Bendis and Marquez were planting a seed with a character they both have a lengthy history with. It’s fitting. Virtually every Marvel book that doesn’t have Star Wars in the title has been effected by Civil War II. Spider-Man is no exception. But in the main series Miles has mostly been a background character, albeit one Bendis and Marquez have made sure to keep around. I keep circling back to the two-page spread of Spidey watching the Hawkeye trial verdict on one of the big screens in Times Square. Intentional or not, it brilliantly positioned Miles as someone removed from some of the larger issues that plague more experienced heroes. There’s a certain naivety about him, partially because he’s so young. Those two elements are what set this moment apart from, say, the vision of the Hulk from issue #2. But lets not kid ourselves. 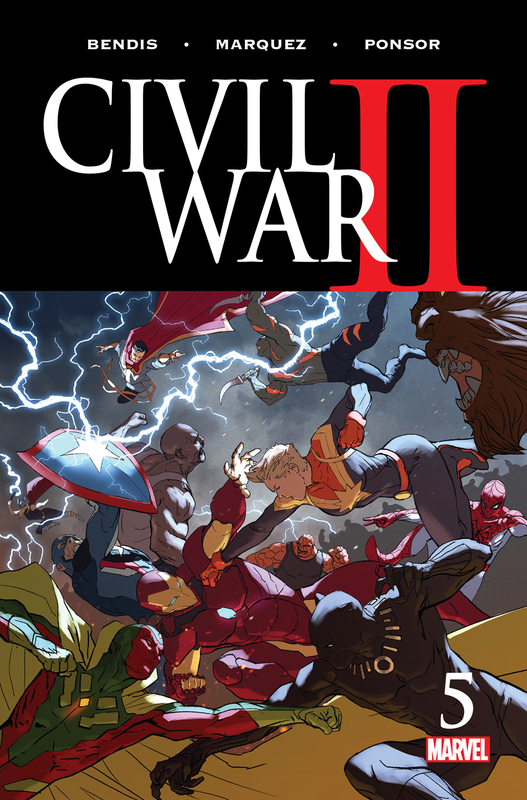 Like its predecessor, Civil War II is trying to be more than just another event comic. Its subtext speaks to the world we live in right now. Civil War speaks to post-9/11 paranoia, and Civil War II speaks to police profiling. It’s not an accident that Miles, a young minority, is shown harming Captain America, a symbol of American justice and values. This entire sequence with the vision and the subsequent arrest of Miles Morales is a Black Lives Matter moment. It’s Marvel looking at what happened with young men like Michael Brown and Eric Garner. It’s one thing to show us characters dying in a story about proactive justice. It’s another thing to really connect it to the real world. 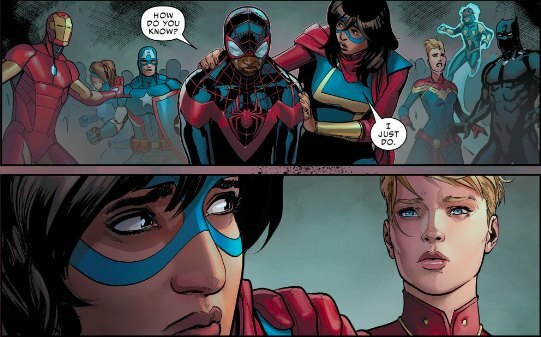 This is the emotional punch that Civil War II has been missing. It’s a shame we had to wait this long to feel it. Ms. Marvel also accentuates the big reveal very well. It feels a little too coincidental that the other teenage minority in the scene just happens to be the one consoling Miles. Speaking of subtext, Miles has an awesome line during a fight with Venom. As the longtime Spidey villain is taking shots at Miles for not looking or acting quite like Peter Parker, our hero replies with: “Another Spider-Man expert telling me how it should be.” That’s barely even subtext. He may as well be looking up at his critics. The sad thing is, most of what we see up until the vision sequence is largely forgettable. Marquez, artist Sean Izaakse, and colorist Justin Ponsor give us a very action-posed two-page spread of the heroes about to collide. There’s also a lovely shot of Hawkeye cloaked in shadow as he presumably goes into hiding (shown below). But by comparison, it all seems very generic and business as usual for a superhero epic. From a comic book sales perspective, DC Comics has outpaced Marvel since the start of its Rebirth initiative. I estimate Civil War II is largely to blame for that. Marvel may have banked too much on the success of its predecessor, and additional eyes from Captain America: Civil War. The story has failed to capture imaginations until now. We finally have something to sink our teeth into, but it may be too little too late. This entry was posted in Comic Books/Graphic Novels and tagged Black Lives Matter, Brian Michael Bendis, Bruce Banner, Bruce Banner dead, Bruce Banner death, Capitol Bulding, Captain America, Captain Marvel, Carol Danvers, Civil War (Marvel), Civil War II, Civil War II #3, Civil War II #5 (2016), comic book reviews, comic books, David Marquez, event comics, female superheroes, Hawkeye, Iron Man, Justin Ponsor, Kamala Khan, Marko Djurdjevic, Marvel, Miles Morales, Ms. Marvel, Red Skull, Rob Siebert, Sean Izaakse, single issue reviews, Spider-Man, Steve Rogers, subtext, superhero comics, superheroes, Tony Stark, Ulysses (Inhumans), Venom (Marvel) on 09/23/2016 by primaryignition.